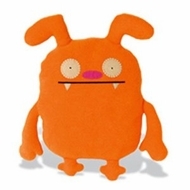 This 7" plush Suddy doll is part of the award-winning Uglydoll family of hip, huggable and collectible artist-created characters that inspire creativity in kids of all ages. Quirky and colorful Suddy doesn't want you touching her stuff. If you can deal with that, you'll get along just fine. There's just one problem though. She doesn't have any stuff. So if she can borrow some of your stuff and then you promise not to touch it while she's borrowing it, you guys should really hit it off. Oh and she doesn't like the dark so much. So if you can kinda hug her really tight at night or when driving through tunnels, that would be great. Unless you're the one driving then no. Does that work for you? Uglydoll is a winner of Best Toy awards from the Toy Industry Association, TD Monthly, Oppenheim, Funfare, Parent's Choice, iParenting, Creative Child and many more. Dolls are recommended for children age 3 and up and are available in three sizes. Uglydoll - pretty ugly.